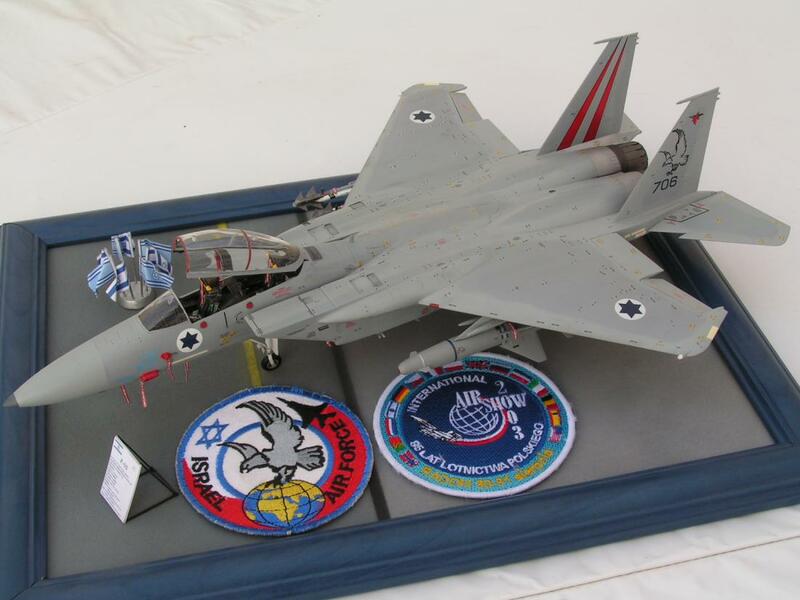 The model represent the IAF F-15D which took part at the 2003 Radum Air Show in Poland. In the last few years the Eagles ("Baz" in Hebrew) in the IAF are transformed to "Improved" Eagles ("Baz Meshupar" or AUP for Avionics Upgrade Program). This AUP Eagle is the 706, called "Cohav A-Tzafon" ("Northen Star", every Baz in the IAF has a name) and was one of the trio which made an historic flight over the Auschwitz-Birkenau concentration camp a few days later after the Air Show. The model is almost BOB except the burners cans, which are from 'Aires'. The Pythons 4 missiles and the AGM-142 Popeye are from 'Eagle Design'. The excellent decals are from 'Isradecal' I also add some scratch built items such pitot tubes and AoA covers. The flags and RFB tags are home made and the patches are from my collection.